Reduces heel pressure with soft foam. Covered with a soft launderable cozy cloth fabric. Hook-and-loop fastener(s) closure for easy application and secure positioning. 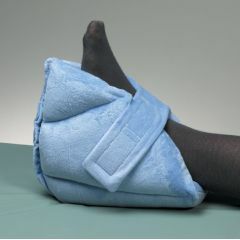 AllegroMedical.com presents The Cloth Foam Heel Cushion. Reduces heel pressure with soft foam. Covered with a soft launderable cozy cloth fabric. Hook-and-loop fastener(s) closure for easy application and secure positioning.